NASA's Cassini spacecraft obtained this unprocessed image of Saturn's moon Hyperion during a close flyby on Aug. 25, 2011. NASA's Cassini spacecraft has captured new photos of Saturn's ugly-duckling moon Hyperion that show its cratered surface up close. 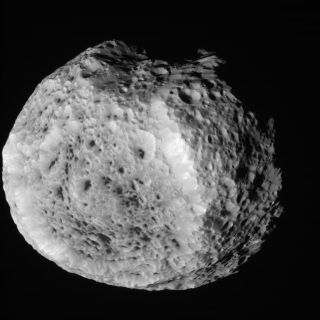 The pictures come from Cassini's Aug. 25 flyby of the Saturn moon Hyperion. The pass, the spacecraft's second closest encounter with the moon, brought Cassini within about 15,500 miles (25,000 kilometers) of Hyperion’s surface. The moon is small — only about 168 miles (270 kilometers) across — and has an irregular shape and surface appearance. As it tumbles along in orbit, the moon rotates unpredictably, preventing scientists from predicting in advance exactly what terrain the spacecraft's cameras would image during this flyby. However, this flyby's closeness has likely allowed Cassini's cameras to map new territory, scientists said. The images should help researchers improve color measurements of the moon and determine how the moon's brightness changes as lighting and viewing conditions change, which can provide insight into the texture of the surface. The color measurements provide additional information about different materials on the moon's deeply pitted surface. This side view taken by NASA's Cassini spacecraft of Saturn's moon Hyperion reveals craters and other battered surface features. This photo was taken during Cassini's Aug. 25, 2011 flyby of Hyperion. This isn't the first time Cassini has snapped close-up photos of the Saturn moon. Cassini's closest encounter with Hyperion was on September 26, 2005, when the spacecraft flew approximately 310 miles (500 kilometers) above the moon's surface. NASA's Cassini spacecraft launched in 1997 on a mission to study Saturn, the solar system's second largest planet. The probe arrived in orbit around the planet in 2004, and is expected to continue taking observations through at least 2017.